My woodworking grandfather built me a rocking horse (and my grandmother painted it!) when I was one – 37 years ago now. I still have it, and now my own daughters ride it. With a little tuning up, I’m hoping my grandchildren can ride it too many years down the road. I have 28 grandchildren more on the way and soon a great grandchild. I see most of my Grandchildren every week they all have toys made by me but the most important gift i can give them is time. They all love the one on one time I give them. I believe that is my gift to each of them. And one of my proudest moments was when I overheard my adult son telling an older man that one his best memories was helping me in my shop and how when he asked me how I learned to do so many things there I told me to try books, magazines and asking friends. Or if that doesn’t work just go for it. You’ll probably figure it out yourself. These ideas bring back great memories and are incentive to make great memories for the future. My grandchildren have come to me with ideas of projects they would like to make their parents for gifts. It gives me an opportunity to teach the use of hand tools and small power tools that they would not experience otherwise. It’s also a source of pride when the parents say, “our kids made that”. Both of my grandfathers were dead before I was born so I did not have direct contact with either. However, my maternal grandmother gave me some of my maternal grandfathers tools which I still have. I was also told by a neighbor who was a student at the elementary school where that grandfather was a custodian that he, the neighbor, learned from my grandfather to put his tools on a board with outlines of each for storage . Now at age 71 I am using every opportunity to do projects in the shop with all 4 of my grandchildren. Last summer, while finishing one such project with my eldest grandson, he turned to me and said, “Grandpa, the more projects we do in the shop together, the more I love it.” For me, that says it all. My maternal grandfather was dead before I was born. My paternal grandfather was old school German. He was retired from the railroad. All I ever remember him doing was sit in a chair. He never spoke two words to me. My father was a master sheetmetal worker. Every time I went into the garage where he worked making whatever he was working on he would chase me off. Therefore I never learned anything from him. Like you, I am now a grandfather. I have a small shop with a few tools. I am anxious to stay building things for my grand daughter. My wife wants a kitchen center for Christmas. Can’t never got anything accomplished. Well, one thing that I have done for years is make nephews, grandchild, and other young people whom I am close to their first carpenters tool box, then for each birthday and Christmas I give them a good quality hand tool. The box has their initials stenciled on it in “their color” and then I mark each tool with “their color” as I give them. Hammer, Combination Square, Tape, Block Plane, chisels, saw, screwdrivers, etc etc. Their parents are the custodians of the Box..Fathers are encouraged to have them help on projects and learn to use hand tools, I like to help whenever I can. This way by the time they reach age 12-14 they have a nice set of tools and know how to use them safely and properly. 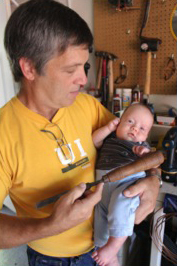 I think your idea of giving tools to the grandkids is great. One aspect of developing an “identity” as something (woodworker, teacher, whatever) is having others affirm your identity. When you give a child a tool you are saying “You are a tool-user.” I have a special ratcheting brace that my Grandpa B gave me after I helped him build some bookcases. I really felt like he was saying “Good job–you deserve this.” My tools are something I take a lot of pride in. My grandfather had tools that my Dad inherited and used for home repairs etc. He added a wood lathe, the last South Bend metal lathe produced before shutting down for war production, a surface grinder, and a home made band saw. He only made one thing that has become a family heirloom because it didn’t work well at all. He was a mechanical engineer by profession and decided to build a device to squeeze a tooth paste tube. It stood about 12″ high and had gears the ” size of a Buicks” to do the squeezing. It ejected the tooth paste out of the top just fine, but getting the paste on a tooth brush resulted in splatter all over the surrouding walls, counter top, and mirrors. My stepmother hated it but dutifully cleaned up the mess every day. I still have it and it weighs about five pounds and my son has made a point of wanting it as a momento of family history. None of my three kids have shown much of a desire to learn woodworking or collect tools. The have all done well, married well, and have home repair etc. skills. But their interests are different, computers, music, and ceramic engineering which are also their careers. Now my grandchildren are developing careers in financial management, automotive design, and computer speed up technology, veternary medicine, sports labor negotiation, and two more still in sshool. I keep hoping that an interest in my 2000 square workshop would be a treasure to at least one of my heirs, but it hasn’t shown up yet. I have been wood working since my grandpa got me the wooden toy set with hammers and a bench. I have been a proud Grandfather for 12 years. I now have four grandkids. All girls mind you. I have taken baby steps with them over the years in the wood shop. I started by making them all wood ducks to push or pull. I then made them all beds to sleep on with hearts of purple hart wood pictures on my page. Since now I am old and have white hair and white beard last year I made 8 reindeer that each one of the girls got to paint and take home for Christmas. I had a bowl of wood fruit in the shop that had spilled across the floor. My granddaughter asked me “Papa”? what is this fruit. I said “OOPs the elves made a mess again. Now she comes down looking for elves. she usually uses the excuse of cleaning my shop with the fox tail. but she don’t fool me she is looking for my elves. Recently I made a pretty music box for one of my granddaughters. When I finished it and played it for the first time I cried. This is when you know your grandkids are special. I don’t force my craft on my kids or grandkids. BUT I do know you hit on what is important and that is our memories of our grandparents. I try to make grandma and papas place a magical place for each of them. I only have one 4 yr old grandson, plus several “adopted” grandchildren. I am now teaching two of my adopted grandkids how to make wooden cars. I teach woodworking one on one in my basement shop in Metrowest boston, and have several posts on craigslist. I have several dozen happy graduates. I have several things both my grampies made in the shop. I especially remember the smell of my grandfather,Tom Allen’s shop with it’s dirt floor, no power tools,and his Cherry Blend pipe tobacco. I was “adopted” by the retired neighbor next door. Summer evenings I would go over and see if his garage door was open, and if it was, I would stop in to see what he was building. Among other things, I learned that shovels could be sharpened. I never knew my grandfathers, as one passed away shortly before I was born, the other shortly after I was two years old. But there may be something in the genes for many of us, as the former longed to be a cabinetmaker and dabbled in furniture all his life, and his father and grandfather both worked part time as carpenters or wheelwrights. The latter was adept at designing and building HVAC, plumbing, and house renovations, and his father built timber-frame churches across the eastern 2/3rds of the US as an itinerant specialist. Bottom line: I now have to grandsons, 8 & 10 who I have introduced to my workshop, my tools, and what they can produce, and I’ve built each of them a 30″ x 10″ x 10″ portable toolbox and filled them a few tools at a time with good hand tools, showing them how to use each one. The older boy has told me that when he grows up, “I want to have a workshop”, and the younger one loves sawing, drilling & hammering, and we just built his first design – his name, in his script, 16″ long, to be put on his dresser top. My two granddaughters have shown some interest, but I don’t see them nearly often enough to be able to have this influence, but there still is hope. My daughter is hoping to have children, and I did teach her to do basic carpentry, change the exhaust system on a car, replace brakes, and do a tune-up, so I’m betting I will be introducing any children she has to my shop. My goal — create the tradition of (at least) skipping generations with woodworking skills, and maybe even keeping it going in each generation. We leave a whole lot worse legacy that that! My grandfather turned 70 the day I was born. He had been a farmer, and made do with what he had. By the time I was old enough to ask questions I’d remember, he had slowed considerably. I never saw him make anything, or knew of a shop on his farm or the home he retired to. I remember him telling me to take care of my tools as he cleaned and oiled the shovel he had just finished using. For some reason that has stuck with me these past 50 years, and I apply that sage advice today. The real gift my grandfather gave to me was his time. I’ve got 3 grandchildren with 1 on the way, and I plan to share that same gift with them, in or out of the shop. As new grandpa I liked this article! For my new grandson, I built a cradle from some local loblolly pine (22″ wide!) from a local sawyer (himself pushing ninety) that had air-dried for forty-seven years. Single piece boards all around. Rocking treadle from white oak and “roof” from poplar (all local). Though I have made many pieces over the years, this, for my first grandchild, will always be special!